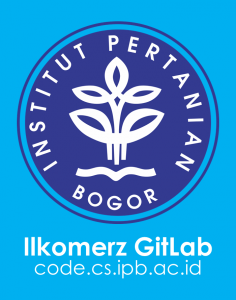 Ilkomerz GitLab is a GitHub-like code repository for students and members of Computer Science Department, Bogor Agricultural University. Manage your git repositories, perform code reviews, and enhance collaboration with merge requests, issue tracker, and built-in wiki. For easy sign in, click the “IPB Account” to the right, and enter your IPB account credentials. Use “Standard” login if you have set your custom password before.